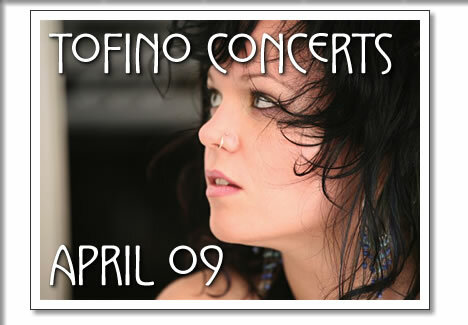 The following concerts in Tofino are happening in the month of April 2009. Tickets are available at Tofitian and Long Beach Surfshop in Tofino. Three piece Toronto electro indie band vitaminsforyou have been touring pretty much constantly taking their high energy show across Canada. Drums, bass, keyboards and more electronics than a NASA launch headquarters are combined live on stage to create a mesmerizing electro pop show that draws all within earshot to the dance floor. Vitaminsyou's sound showcases a penchant for pop melodies and vocal refrains, albeit with a distinctly tougher edge. Front man Bryce Kushnier is joined by veteran Canadian musicians David Foster and Duncan Christie to create an on stage powerhouse of sound that is unique and fresh. teaming up with Chris the Dread and Shawn Lennon so go grab some sushi and listen in. Vancouver's resident dance-punk savants You Say Party! We Say Die! are a catalyst on the edge of a scene brimming towards explosion; hybridized, mechanized, philosophizing machines that have learned self-awareness and found their soul. Self-styled pioneers and genre-warriors alike are noticing that this is a band taking on the world on their own terms. They are reaching a fever pitch in Vancouver's indie rock scene with their insanely catchy beats and viciously fun live show. Reminiscent of the vocal stylings of Yeah Yeah Yeahs, YSP! built upon textured melodic ideas that complimented their spastic, but richly diverse rock riffs. YSP! 's perpetually dance-inducing tracks have gained them considerable attention amoung the dance rock scene in Vancouver. Smalltown Empire will be launching their five song EP at Darwin's Cafe in the Botanical Gardens on Thursday April 22nd. Following up their recent west coast tour the lover duet spent some time in the studio this March and is excited to release some of their songs to the west coast listeners. Co-writers Ron Weeks and Anne Klazek, both solo singer songwriters in their own right, spent the winter collaborating and combining musical forces to create the dulcet tones of Smalltown Empire. "I saw her at open mic and immediatly i asked her if she'd be the June Carter to my Jonny Cash and the rest is history" said Weeks "I just like singing with her." Admission to the cafe is ten dollars and includes a copy of the duets latest recording. Doors open at 8:oo pm beer, wine and snacks available during the performance from Darwin's cafe. Murge has been playing the club scene for over 10 years now. His eclectic up tempo sets always keep the booty's shaking . His style of music caters to all tastes across the board. If it's funky it's in his set. He pushes fresh music and new music, and is best known for digging up surprises from the past. Murge has produced tracks for the likes of Slug (Atmosphere), Swollen Members and remixed work for Tegan & Sara. It seems the key to success in this game is diversity, and the ability to wear an infinite number of hats, while still maintaining your core vision for your art. Murges Dj sets are the product of his vision for his music, and through it, he hopes too show the industry, and the clubbing community, that its time to start paying close attention. The second annual Live at the Weigh West cd will be recorded in the newly rennovated coho room on Monday, April 20. The recording starts at 9pm and includes a long list of local performers including Chris Dolphin, Julie Robinson, Left at the Junction, Matt Lovegrove, Natasha Radojevic, Shazam, the Weigh West Bluegrass Band, Smalltown Empire, Duncan Booth and more. The event compliments the monday night open stage and brings local musicians together to lay down some tracks and get their songs out there. A follow up release party is planned for early June and the recording will be sold at various locations throughout Tofino this summer. Production of the project will be done by Treefrog Industries and part of the proceeds will be donated to the Tofino Hospice society. For more info, contact info@treefrogindustries.com. Hailing from Welland, Ontario, Attack in Black, have quickly won over audiences and critics with their merge of the soul of old school rock 'n' roll with the body of modern day punk rock. Although Attack in Black's sound may at first closely resemble popular forms of punk rock, it is not fitting to simply categorize the quartet as a "punk rock" band. The band draws from many unlikely sources for inspiration, such as Neil Young, The Ramones, and Charles Bukowski. With infectious melodies and unique vocals, their lyrics are thought provoking and insightful. Attack in Black's swaggering, spirited live set can convert even the most jaded concert-goer. Woodland telegraph (ft. Matthew Lovegrove) is touring Vancouver Island with a cast of talented musicians and will performing at Sobo on Wednesday April 22nd. Come out for a night of "acoustic revelry" as Woodland Telegraph and Northern Folklore artist Happy Feet Howe bring you some of the finest Canadian roots-rockabilly-Blues this side of anywhere. Nothing like some amazing harmonica and mandolin songs to accompany some delicious home cooked Sobo. Music starts at 8:00 pm and donations will be collected for the musicians. Mad Professor was born Guyana Africa. He is a legendary dub music dj, producer and engineer known for his original productions and remix work. He has collaborated with reggae artists such as Lee "Scratch" Perry, Sly and Robbie, Pato Banton, Jah Shaka and Horace Andy, as well as artists outside the realm of traditional reggae and dub, such as Sade, Massive Attack, The Orb, and Brazilian DJ Marcelinho da lua. His live shows are hoppin and involve heavy heavy bass lines, live vocalists and a sweaty sweaty dance floor. This is the show not to be missed this spring.